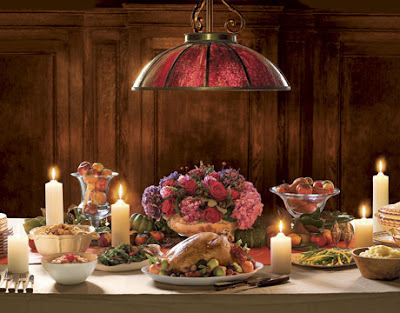 It won't be too long before we are gathering with our families and friends to enjoy what will probably be the first of many fabulous holiday meals between Thanksgiving and New Years' Eve. We usually go out to eat for Thanksgiving since I am not much of a cook and this way instead of being stressed, we can just focus on enjoying each others company. My grandmother and mother were and are fabulous cooks (that gene didn't carry down to me) and I have many fond memories growing up with great home cooked Thanksgiving meals and a lot of football watching. I truly admire a well set table and consider it an art. Here are a few ways to make your Thanksgiving table a feast for the eyes. 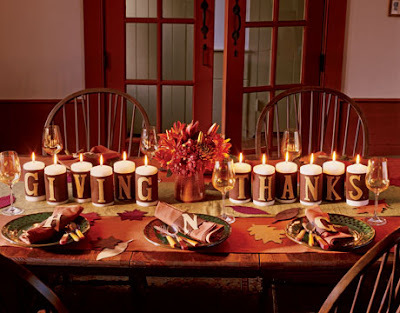 Country Living has a beautiful slide show on Thanksgiving table settings. I've picked a few of my favorites to highlight. 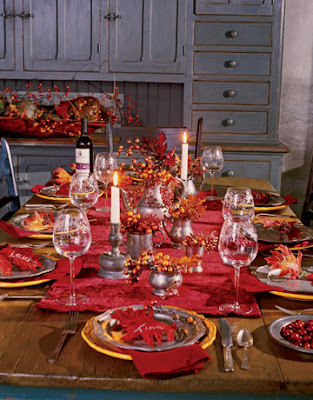 I love the colors on this tablescape, just so warm and inviting. I love the getting the kids involved with the table decor. These ideas are fun for the whole family. With a big group of family and friends, a buffet is definitely the way to go. This buffet display is so inviting. Candles add so much to the mood of the evening. So much of a buffet is in the way the food is presented. Who wouldn't love a dessert buffet dressed up like this? 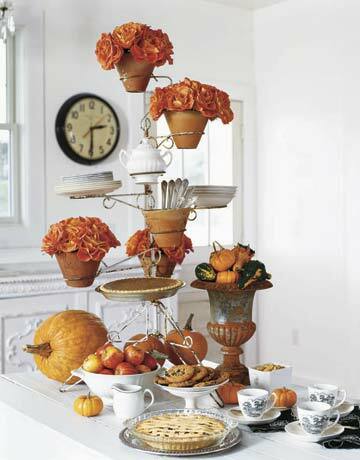 The potted flowers and pumpkins and gourds add so much to the harvest theme. Sweet Something Design created a tablescape I just adore. I love every thing about it and I can see the place setting as being something easily put together by the average and even challenged entertainer with some visual cues. This talented blogger bought her dishes at Wal-mart years ago and did a fabulous cornucopia centerpiece. She even shows how she used the same dishes to create another Thanksgiving display. You can create a beautiful table on a budget with creativity, imagination, and some guidance. Paper & Cake Printable Partyware offers entertainers some free downloads to make their job easier. Choose Modern Folk or An Elegant Table, either one is beautiful. If you don't believe me about tablescaping being an art, then just check out the blog, Between Naps on the Porch.﻿ Susan, who writes this beautiful blog, has perfected the art of tablescapes. If every you need inspiration, you can find it from her or one of her many followers who like to participate in her special weekly hosted blog parties known as Tablescape Thursday. 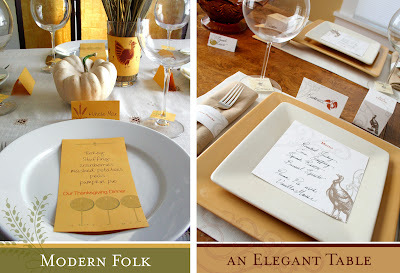 Susan has not done her 2010 Thanksgiving tablescape yet, but here is link to her 2009 BNOTP Thanksgiving tablescape. These are some amazing tablescapes, aren't they? My mother is an amazing hostess and a whiz with centerpieces, but even the best hostesses can use some inspiration every now and again. When I am in doubt and looking for inspiration in interior design I often turn to magazines or the internet for a spark of creativity. The inspiration is there for setting a beautiful table too. Just look for it! I always love to look at pictures of tables, whether dining or just an everyday tabletop vignette, for inspiration and ideas. I have joined in on Susan's linky party on occasion and there are some wonderfully talented bloggers who set a beautiful table. It is a great source for inspiration. On a side note, our family thanksgiving h as changed over the years from a traditional one to one that is quite non-traditional. As many in my family work retail they must be available to work on Black Friday - very early, getting up at 2 and 3 a.m., so a Thanksgiving dinner is sometimes not possible. This year we are going to have our Thanksgiving a weekend or two after the actual date. Susie, I'm late in seeing this but wanted to say thanks so much for the shout-out! It's almost that time again...Thanksgiving will be here before we know it.